Kriti Gupta is an Indian CPA. She successfully managed her firm that specializes in forensic accounting, risk assessments, assessing and evaluating internal controls, financial reporting, forecasting models, due diligence and other consulting services ina somewhat still male-dominated career. Her certification in Forensic Accounting and fraud detection coupled with her critical and analytical thinking enabled her to carve a niche and make a name for herself. She has been deeply involved with the community and has worked as a mentor, faculty and career advisor to students in India. She is a voracious reader and considers herself a food savant. She loves traveling and learning about different cultures and sharing her culture. She considers her two years at Notre Dame as one of the best times in her lives having made lifelong friends and a diverse cultural experience. Success for her is seizing opportunities to continuously learn and challenge herself. Her MBA from Notre Dame has honed/ amplified her abilities as a strategic decision maker capable of solving problems and provide recommendations. Her summer internship during MBA with a Private Equity company gain experience in real estate industry with a focus on a blend of operation and finance. 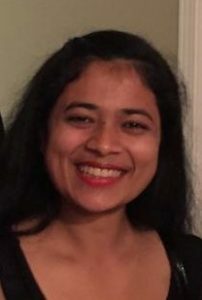 She is actively involved with the community as the Chair of Notre Dame Women Connect Seattle Chapter and Diversity Chair of ND Club in Seattle and continues to provide leadership and mentorship. A great meeting this morning – the room was full and the energy was high! We kicked off with Howard Johnson leading the invocation and telling us about his experience in India and seeing Gandhi’s house. A thoughtful moment for us all. 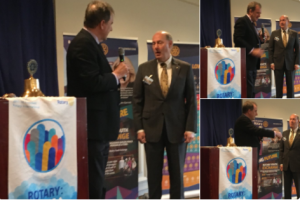 We introduced our guests, including two Rotarian visitors – Debbie Moore and Stan Foster, as well as the many guests joining us from the Bellevue School District to participate in Mock Interviews with our members. Next we introduced our Student of the Month -Lauren Piechard. She has 3.8 GPA and likes soccer and Ultimate Frisbee. She participates in Forefront to prevent suicides and also supports Ultimate Peace. We wish her much success in her continued journey. Dennis Newell and crew led his team on promoting our Retreat for 4-5th May and he wanted to remind our members that we have until 30th March to make our payment to participate. We have 14 members signed up and we want more to join us, so we can plan for the clubs future. An opportunity for fellowship and club service in Leavenworth. We had an enjoyable opportunity to learn about our speaker’s journey from India to the US. Kriti Gupta was able to show us that there is more that binds us than divides us. We should use these opportunities to find the best from our differences and bind together through our diversity. Thank you for the reminder Kriti! 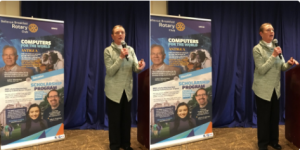 Our thanks to Helen Banks who addressed our Rotary members on the work of the Eastside Baby Corner in giving children a stronger start in life with adequate food, clothing, beds or safety equipment. BBRC has supported Eastside Baby Corner and we look forward to continuing to do so in the not too distant future. We will be looking to organize a work project at the Issaquah facility in July /August and more information will be made nearer the time. We will keep you posted. 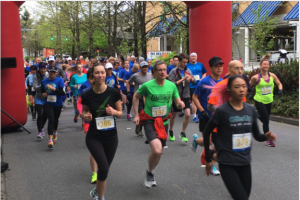 The Bellevue Breakfast Rotary Club (BBRC) with their partners Kindering, and Special Olympics, are encouraging everyone to seek healthy lifestyles by signing up for the All in for Autism 5K/10K Run/Walk on the April 29. Click on the yellow button to read the Bellevue Reporter article!